Road repair cash is there, so why months-long delay? 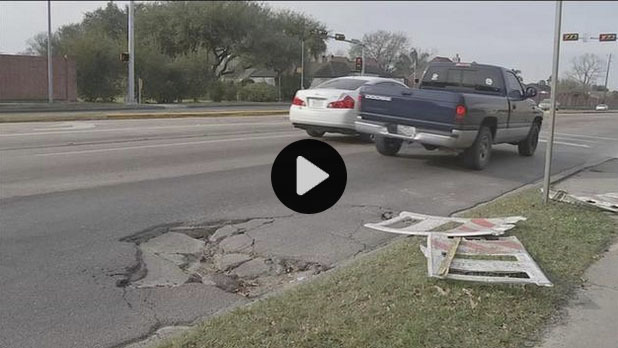 HOUSTON (KTRK) — After an ABC-13 investigation in April showed a steep decline city road-paving and pothole fixing, Houston city officials quickly said they would find additional money to help fill the gaping, tire-ripping holes in city streets. By May, Mayor Annise Parker proposed — and City Council signed off on — $10.8 million of additional taxpayer dollars from the city’s drainage fee targeted at fixing Houston’s roads. HOUSTON (KTRK) — Mayor Annise Parker weighed in the day after ABC-13’s investigation into the city’s Busted Broken Pothole Process, calling the city-wide ragged roads an “emergency” and a “crisis,” but also saying she has confidence in the city’s public works department. “I have done what I’ve needed to do,” Parker said. ABC-13 was flooded with comments this week from dozens of viewers who disagree. They used the phone, Facebook and Twitter to share stories and photos potholes and ragged roads in their neighborhoods that have remain unfixed.